Photo. Sanna (7 years) from Norway at the photo points at a reindeer sunbathing on the shore of the river. © Travel Explorations. Both the river itself and the nature around are full of life. That`s what we experienced on our 24 km paddling trip from Kiutaköngäs to Jäkälämutka. It took us 6-7 hours on a beautiful, almost perfect day, on 8th July 2012. 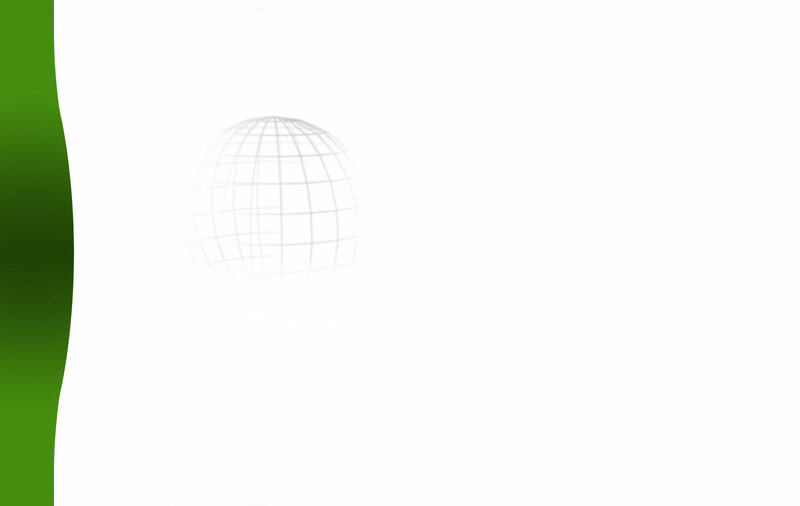 It was our lucky day. The weather cleared up in the early afternoon and it stopped raining. It was predicted that a thunderstorm could cross our way, but the weather turned well for us during whole the trip. The Oulanka river is a stunning river that winds through the Oulanka National Park into the White Sea in Russia, passing camping spots, small islands and sandy beaches. On our way we were surrounded by wild canyons and virgin forests. The riverbanks are lush with plant and animal life. Many times we could observe jumping fishes, ducks, birds, reindeers sunbathing at the riverbeds and one time we were surprised by an elk, moose, emerging ca. 50 meetres in the front of us. Watch selected photos from our tour on: Finland Adventure Travel on Facebook. One time our canoe got stuck. I had to jump out of the canoe and into the shallow water for pushing it further. It was a sandy bottom so it was not hard for my bare feet. 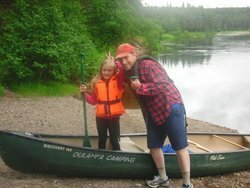 Another time we lost a little bit control over our canoe due to strong currents, so we crashed softly against the shore where it was some trees and bushes. It`s important to be concentrated whole the time even this river runs quite flat. Photo. Paddling in a wonderful landscape. Most of the tour the river flow carried the canoe forward making paddling easy for us. In the silently gliding canoe we got as close to nature as practically possible. In one day we paddled 24 km up to the Russian border, but not without a break. Photo. 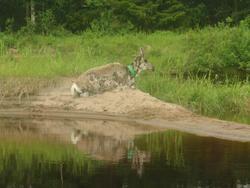 A reindeer taking a rest at the shore of the river. © Travel Explorations. We stopped just one time for a picnic. On the half way we really needed to take a rest. On the shore we met two persons who have been walking around in the forest. The first night they slept in a tent for some hours. In the late night it started to rain heavily and their tent got soaked wet. Fortunately they found a small cabin nearby. Here they tried to sleep againg, but it was impossible: the cabin was full of bloodthirsty mosquitoes. So they had to pack their stuff and escape out again in the rain. Photo. Sann and Stein Morten after taking a rest at a caming site on our half way. © Travel Explorations. At the resting place we couldn`t sit down quitely for a moment. The mosquitoes were all over us and didn`t give us a chance to relax. I and my daughter ate and drank at the same time as we walked around the table. We couldn`t stand out there for a long time, so we jumped in our canoe and started to paddle again. Photo. Stein Morten and Sanna reached the final target. Time for celebration. © Travel Explorations. Anyway it was a wonderful experience for us both, observering the wildlife and admiring the wild nature. It took us only 45 minutes from the center of Kuusamo and 30 minutes from Ruka, to drive to the camping site where we started our paddle tour. It was well worth it. The Oulanka river is a perfect place to spend a peaceful day, but take your precautions just in case the weather changes. Close to the Arctic circle, Kuusamo is the district in which you will find Ruka, Finland’s most popular ski resort just a 20 minute drive from the city centre and the Oulanka National Park, one of many national parks and nature reserves in the area, where the world famous, 80km long, karhunkieros (bear trail) hiking trail runs. It´s easy even for the beginner to paddle with a Indian canoe. 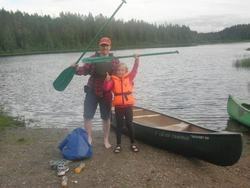 Canoeing is one of the best activities which Finland with it´s thousands of lakes can offer. 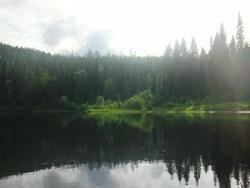 The river Oulankajoki flows through the Oulanka National Park into the White sea in Russian. Especially the routes starting from Kiutaköngäs are suitable for beginners and families. The river is flowing peacefully from Kiutaköngäs through Nurmisaari and Jäkälämutka. It's mostly flat water and there are no rapids on the way. 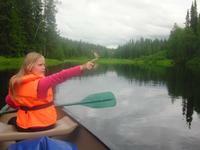 The total length of classified lake and river canoeing routes in Kuusamo is about 350 km. These classified river waters include the Oulankajoki, Kitkajoki and Kuusinkijoki rivers and the upper course of the River Iijoki waterway. There are lake routes on the lakes Kitkajärvi, Kuusamojärvi, Muojärvi, Kiitämäjärvi, Kirpistöjärvi, and Suininkijärvi. There are two excellent rivers for trout fishing, the Oulankajoki and Kitkajoki rivers, which run through the Oulanka National Park. Surrounded by wild canyons and virgin forests, fishing in the park offers a truly unique and enjoyable experience for both novice and expert anglers.